DCILYxMugHug™ – Dear Coffee, I Love You. I’m excited to announce the first ever collaboration for Dear Coffee, I Love You. 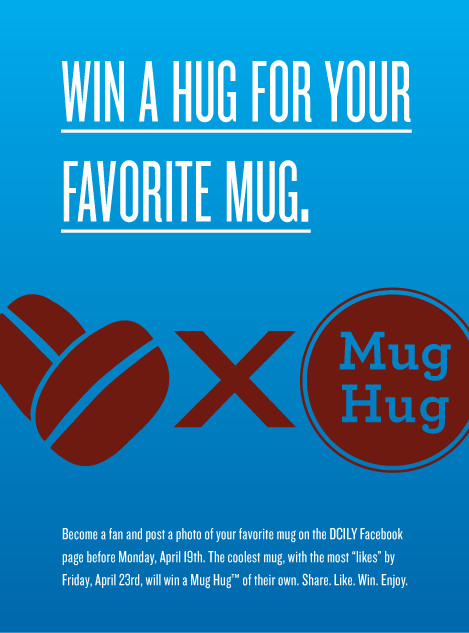 We partnered with the great people at Mug Hug™ to bring our readers the first “Give your mug a hug!” contest. All you need to do to enter is take a photo of your favorite mug and upload it to the Dear Coffee, I Love You fan page on Facebook—before Monday, April 19th. Beginning on Monday, whichever mug gets the most votes (i.e. “likes”) by 3pm est on Friday, April 23rd, will win a free Mug Hug™. The lucky winner will be able to carry coffee in your favorite mug wherever you go!